Make it nine in a row. 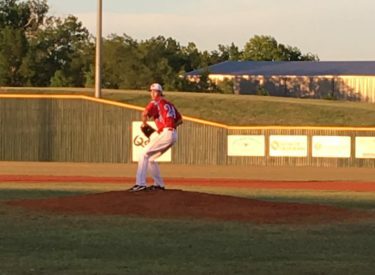 The Liberal Bee Jays defeated the Oklahoma City Indians 8-2 Wednesday night in Edmond at Oklahoma Christian University. The Bee Jays scored two in the first four innings and six in the last five for the win. Josh Sieglitz pitched 4 and 2/3 innings allowing two runs. Thomas Garland went 2 and 1/3 scoreless. Chance Carner and Trent Maloney added scoreless innings. The BJ’s loaded the bases with one out in the first but did not score. Chad Kennedy delivered a two RBI single up the middle in the second for a 2-0 lead. The Indians Brendon Ezell homered to left in the fourth to make it 2-1. Liberal added a run in the fifth when Garrett Scott doubled and scored on a Kyle Schmidt sac fly. OKC came right back with a run in the fifth. But Schmidt’s two RBI double to right center in the seventh gave the powder blue and red a 5-2 lead. Cale O’Donnell added a two RBI single in the eighth. And Nate Crossman walked with the bases loaded as the Indian bullpen struggled. Garrett Scott reached base all five times up and was 3-3. Kennedy and O’Donnell added two hits a piece. Liberal remains in first at 12-3 while the Indians are 3-12. The same two teams meet at 7 Thursday night in Edmond with the game airing on 1270 and kscbnews.net.